Home / FINANCE / Recent NIBSS Data findings reveals the rise in failed POS Transactions in Nigeria! Recent NIBSS Data findings reveals the rise in failed POS Transactions in Nigeria! 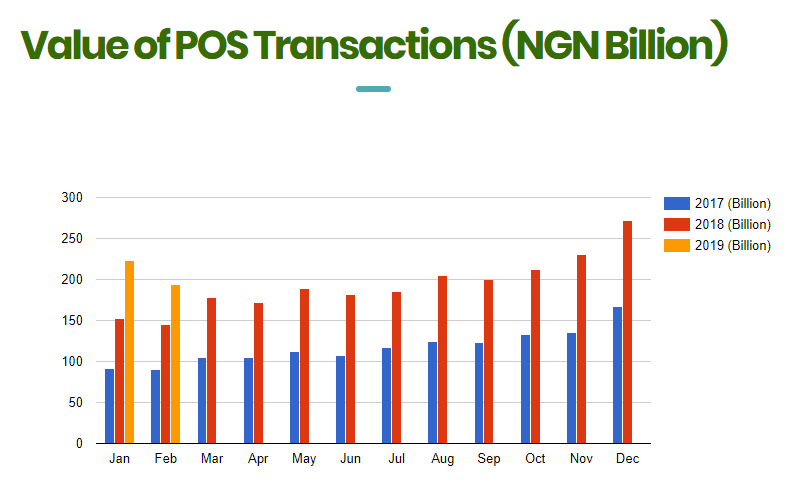 Data from the Nigeria Inter-Bank Settlement System (NIBSS) shows that POS transactions have fallen since the start of 2019. 2018 was a very vibrant year for POS transactions. According to NIBSS data, POS transactions in Nigeria topped N2.3 trillion. That’s an incredible 65% leap from the N1.4 trillion recorded in 2017. 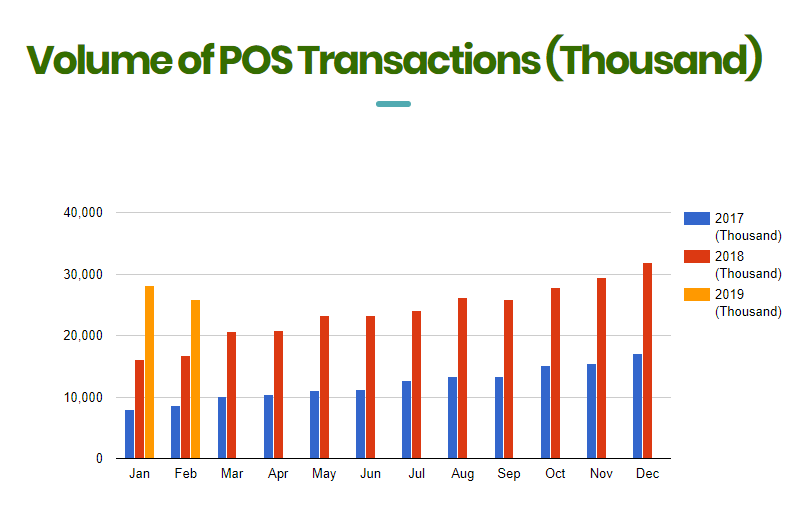 However since the start of 2019, POS transactions have dropped month on month for the first two months of the year. While in December 2018, the value of POS transactions stood at N271.95 billion, that figure has dropped significantly over the last two months. In January 2019, transaction value declined to N222.291 billion; that’s an 18.26% decline. And in February 2019, it further declined to N193.425 billion, a huge 28.87% dip from December 2018 figures. Transaction volumes have also been slipping too. In December 2018, the volume of all POS transactions was 31.9 million. But in January 2019, it dropped to 28.1 million. It further dropped to 25.8 million in February 2019. On the one hand, the decline is not uncommon or surprising. Since 2017, NIBSS data has always shown back to back declines in POS transactions for January and February. Also, December is a peak period for retail spending, so it’s not unusual for declines to happen in the next month. In fact, for 2017 and 2018, POS transactions drop in the months of January and February, but grew again in the month of March. But this time around, industry players may need to be concerned about the latest drop. And the reason is simple: high rates of failure for POS transactions. According to real time data from the NIBSS, 340,653 POS transactions had been made by 12:37 PM today. However the failure rate stood at an incredible 28.34%. In other words, over 96,000 POS transactions have failed at that point of the day. In 2018, the volume of POS transactions stood at over 285 million, but failed POS transactions accounted for just 9% at 27 million. But in March 2019, the failure rate is growing fast. While in March 2019 the Guardian believed 30,000 failed transactions was a “typical bad day”, today’s 96,000 failure rate just usurped that figure. However NIBSS insiders say the issue is multifaceted. One the one hand, sources say the issue is caused by a host of problems both from the clients and the providers. This is not surprising though. In 2018, NIBSS attributed 19.9 million failed transactions to “insufficient funds” on the client side. But insiders still believe the issue in March has grown out of hand since the NIBSS platform crashed on December 24, 2018, a peak period. On that day, failed transactions reached 25%, which is still less than today’s failure. Meanwhile the NIBSS has blamed the problem on an “industry system glitch”, a pragmatic way of not apportioning blames. “I cannot be here now to pass the buck or apportion blames,” says Lillian Phido, NIBSS Spokesperson. “When issues like these come up, the tendency to apportion blames and not be responsible is there. The truth is that there are issues, but they industry glitch. Everyone is needed to resolve it,” she told the Guardian. @DiamondBankHelp @DiamondBankNG today is the 15th day of not resolving a failed POS transaction reported to you. DB-190319926160. It's really unfortunate that you abandoned this case except you are prompted. I'm so discouraged at the failure rate of your online platforms. Nevertheless, if the situation continues unchecked, it is the customers who will lose. Failed POS transactions sometimes lead to accounts being debited. Reversals do occur automatically many times. But other times, users have to make the complaints themselves, some times very aggressively, before it is done. With failed transactions ballooning in March 2019, banks should expect a lot of customer complaints. Austhoorma on JAP, ActionAid synergise to fight corruption, poverty in Nigeria!